It is said that the purpose of life is to contribute in some way to make things better for other people. 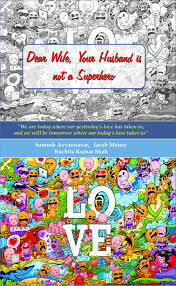 These two recently published books Dear Wife , Your Husband Is Not A Superhero and Second Heart are exemplary to the said notion . No , these two books are not ordinary works of fiction . Santosh Avvannavar, Author of Adhuri Prem Kahaniya , Dear Wife, Your Husband is not a Superhero and Second Heart and Raghav (IT Geek) brings a new book this June! Today singed a contract with a leading and large publication house. This winter we authors Santa Santosh Avvannavar, Raghunath Are, and Jyothi Byahatti bring you warmth through Seven Love Stories! Stay tuned!